The completion of high school and the transition into the next chapter of education is a very exciting time. Applying to colleges, receiving the ‘fat envelope’, choosing classes, moving away from home, and living with a roommate for the first time, are all new and exciting experiences. Arriving on campus and the first few weeks on campus will be exciting and full of change. You will meet a variety of new people and have many new experiences. The one thing that remains constant is adhering to your low protein diet and drinking your PKU formula daily. Keeping your PHE levels in control when you don’t have your family watching over you may be more difficult than anticipated, but at the same time, more important than ever. The key is to FOCUS and make a PLAN! Commit yourself to your PKU diet. Long lectures, late nights studying and preparing for exams will require you to be at your best and drinking your PKU formula daily, spread throughout the day will be one of your tickets to success. As you know, elevated blood PHE levels are linked to reduced executive function skills such as memory, recall and concentration. Write out your daily schedule and include dedicated time to mix and drink your PKU formula. This will help make formula part of your day and reduce accidental skips. Add formula powder to an empty water bottle (or other reusable container) that you can fill with water later for formula anywhere, anytime. Is your dorm far from campus? Rent a locker at the school gym or student union to keep your formula so you can refuel in between classes and don’t have to go all the way back to your room. Choose a formula that is sold in single-serving, travel friendly packaging. Powders in little pouches can easily be added to store-bought beverages while on campus or out with friends. Periflex® LQ is a ready-to-drink formula that provides 15g PE in a highly portable and easy-to-drink container for long days on campus. 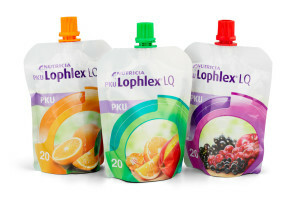 PKU Lophlex® LQ is a ready-to-drink formula that provides 20g PE in only 4.2 fl oz. Quick and easy to drink down and get back to the book. 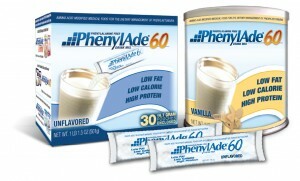 PhenylAde 60® is a low volume formula that mixes with only 3 fl oz of water for 10g of PE or any protein-free beverage you enjoy. REQUEST A FREE SAMPLE of a Campus Friendly PKU Formula today! Talk with your metabolic dietitian or clinic to find out which PKU formula from Nutricia may be right for you. Always consult a healthcare professional prior to making any changes in your PKU diet plan.